SAN BERNARDINO, Calif. (July 16, 2009) – Peak engine performance is only achieved at optimal coolant temperatures.Like many UTV motors, the RZRs 760cc Twin sometimes struggles to accelerate its half-ton of side-by-side fun and remain properly cooled in less-than-optimal conditions, such as when slogging through mud holes or hammering around the dunes. At various levels, this can lead to overheating, short-term power loss, premature oil breakdown or worse. To ward off these worries, FLUIDYNE® Powersports new Polaris RZR radiator was developed to enhance low-air-flow driving conditions and provide consistent cooling in high-speed. Boasting increased width at 38mm deep (12mm deeper than stock), 32-tube core, this beefy unit has 53 percent more fluid capacity (1360cc vs. 887cc) to significantly lower coolant temperatures. These upgraded specs are bolstered by FLUIDYNE”s® unique, positive-sealing, internal, splitter-plate design which ensures that every ounce of fluid circulates through its core. 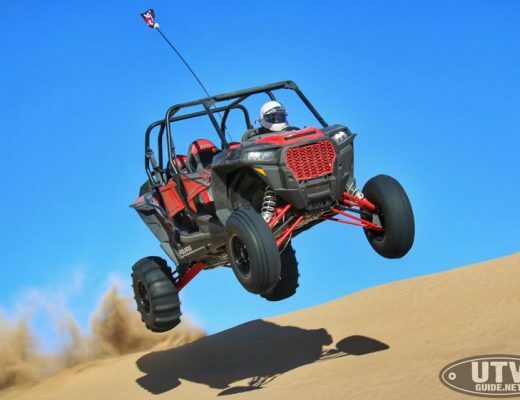 FLUIDYNE”s® new RZR radiator is also stronger and more durable than its OEM counterpart. Constructed from aircraft-quality aluminum, structural improvements include thicker materials throughout and beaded hose connections for leak-proof sealing. These components are held together with beefy TIG welds to withstand extreme conditions and produce a crash survival rate far exceeding the OEM unit. The kit also includes two aluminum spacers that shim the heat-sensitive black box out of harm”s way. Not only does FLUIDYNE® Powersports” new RZR radiator out-cool and outlast the stock unit, it comes with a one-year warranty and installs easily, utilizing the factory mounts, hardware and fan assembly. Winners in the 2009 Baja 500 Utility ATV and Open Pro Motorcycle classes, FLUIDYNE® Powersports radiators have been proven around the world. 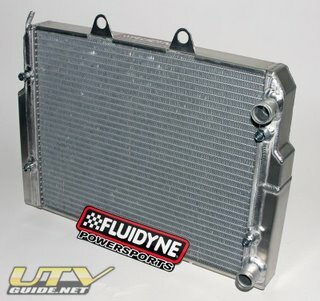 Developed and manufactured in the United States, they are built upon 50 years of experience in vehicular fluid dynamics.Available for the Polaris RZR and other late-model side-by-side vehicles, ATVs and motorcycles, FLUIDYNE® Powersports radiators are sold through dealers nationwide. When the heat is on, FLUIDYNE® Powersports radiators keep things cool. FLUIDYNE® Powersports is dedicated to designing and manufacturing high performance radiators and related products for the powersports market. For total reliability, today’s hi-tech powersports engines must operate at properly controlled temperatures…this is where FLUIDYNE® Powersports earns its reputation. Riders and engine builders alike rely on the added confidence provided by using FPS products.